Home » Mac OS X » Ampps ionCube Loader Fatal error: The file /Applications/AMPPS/..
AMPPS ionCube Loader Fatal error: The file /Applications/AMPPS/ampps/softaculous/enduser/globals.php cannot be decoded by this version of the ionCube Loader. If you are the administrator of this site then please install the latest version of the ionCube Loader. in Unknown on line 0 – Are you currently searching for a solution to fix this? Read this post how I finally found a way to fix this Ampps ionCube Loader Fatal error message on a Mac. After trying many ways, including downloading the .so file from ionCube website. And It did not work for me. The only thing that works for me was, update Ampps to the latest version. I have installed and used this localhost software for quite sometimes now, and I do really love this application. I have used the version 3.6 until today, and it has been running well. However, I don’t know why, all of sudden this morning when I opened my Ampps, I could not open it, only saw that error on my browser. I didn’t change any configuration of my Mac or the application itself. Of course, I have been googling around this error, to find out if I was the only person who got it. Or, is it a common issue using this software. And I found this forum thread from Softaculous. The method you can try first. I keep on visiting forums (because I did not want to do update, worried loosing my stuff) that show me many people have this problem from the last years until recent. Most recommendations is downloading the newest ionCube loaders. I tried them all, was quite tired from copying, pasting, and restarting my app MANY times. 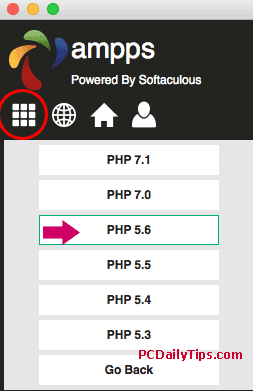 I also download the ioncube_loader_dar_5.6.so because I was using PHP version 5.6 but it did not work either. When this method does not work for you as well, last option, you may want to update your current version of your software to the newest version. I did it and it worked. There are a few things you should pay attention first before you do the update though. My fix was to update my application. Before updating, you should backup the necessary files and folders, just to be prepared in case something happened. If your projects are WordPress websites, I recommend backing up all of your sites that you don’t want to lose, check out my video tutorial on this. I also showed you how to update MAMP a few months ago, check the tutorial if you need it. In my experience on updating this software, I would NOT lose my projects, but just to be careful than being sorry, loosing all of your work. Inside your /Applications/AMPPS/, backup these following folder somewhere else, I did it on my desktops: ampps, conf, mysql, private, var, www. Additionally, you can also backup your hosts file of your computer. If you are using Windows PC, read my tutorial how to find the Windows hosts file here, and for Mac users, you can find Mac hosts tutorial here. 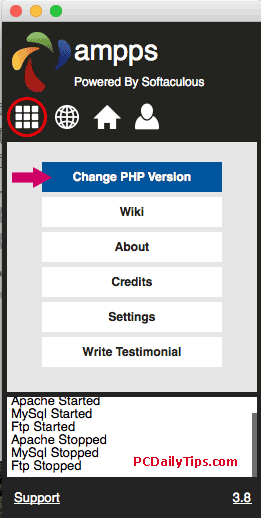 Once you do the back up, you can visit their official guide how to manually update the software. Open terminal, and copy and paste these commands one by one. If you are in doubt about this, watch my below video tutorial for non-techie on how to do this. Enter your Mac login password. Once you are done, restart your app and you will see it is updated and the error message will be gone. For other operating system users, you can read their guide above and the method will be almost similar to this method. Once I restarted the app, I was quite worried, because I did not have mood to restore things again. Luckily, the app just works exactly the same, so I did not need to use the backup files. I just deleted mine, because I have all of my projects, mostly WP localhost projects. Let me know which method that works for you, I am interested to know this.